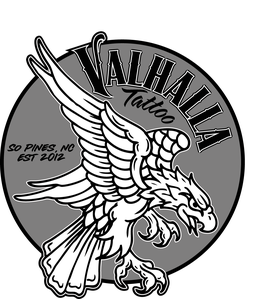 ETIQUETTE AND SHOP POLICIES - Valhalla Tattoo and Gallery "Southern Pines Premier Tattoo Location"
We are a tattoo focused shop and do not offer piercings. We don't like rules any more than the next guy, but we have found a few things which make the tattooing experience better for everyone. Every tattooer draws and approaches each tattoo differently. The most important step in getting a great tattoo that you are going to love is choosing a tattooer whose style is appealing to you. Reviewing a tattooers portfolio will help you determine if they are a good fit for you. It is unlikely that the portfolio will have the exact tattoo that you are looking for, so instead you should determine if the tattooers previous works are appealing to you. For instance, if you are searching for someone to do a photorealistic tattoo and there is no such work represented in their portfolio, it is likely that they either don't do this style, or they don't do it frequently. Likewise, if their portfolio is all photorealistic, it probably wouldn't make sense to ask them to do an American Traditional tattoo. The best way to get a good tattoo is be comfortable with the tattooers previous work, and let them create the best tattoo for you with minimal constraints. Custom tattoos require some sort of consultation and a face to face meeting is the best way to communicate ideas. We have found a few things that make the consultation process more streamlined, while providing the best customer service. First, make sure that the artist you choose is the best fit for your idea. Please read the paragraph above, “Choosing a Tattooer” and view portfolios (galleries). Second, an artist will not be available for a consultation if they are tattooing so a CALL is recommended before stopping by. Third, bring all available references to the consultation to help the artist better understand your idea. While we pride ourselves in being a laid back, family-loving tattoo shop, we do ask that you do not bring children with you when coming into the shop. While friends and family are welcome, state law does not allow them to be in the same room as those getting tattooed, meaning they will have to stay in the waiting room. Please keep in mind that our waiting room is not very big, so large groups do not work well. We work primarily on an appointment basis. Please be on time for your scheduled appointment, and call at least 24 hours in advanced if an appointment cannot be kept. We require $100 deposits for appointments at the time of booking. This “non-refundable” deposit is a guarantee that you will show up at the agreed time for your appointment. After the consultation and on the day of your appointment only minor changes are able to be made to the design. Your deposit will be considered a drawing fee if you decide to completely change the design. If you can’t make your appointment, you must cancel at least 24 hours in advance or you will lose your deposit. If you cancel your appointment you must reschedule within 2 weeks. If you show up at the agreed upon time the deposit will be applied to the price of the tattoo. For multi-session tattoos (sleeve, back piece, etc) the deposit will carry over and will be credited toward the last session.